I listed a few people who wrote about it in a previous post, and I have found a few more since then. Many people report the same effect. I think that perhaps helping develop and/or reinforce consistency might also be a factor. A couple of things made me stop in the past. One is that I kept coming with idea lists about idea lists. It was getting too meta for me. I don’t want to make idea lists about making idea lists (process, results, lists of ideas for future lists), but it might not be a bad thing to do every once in a while to have a backlog of possible topics, like agile teams keeping a backlog. Another is that since then I have gotten more serious about meditation. Wouldn’t quieting the mind and accelerating it be at odds with each other? Meditation seems to stop unnecessary thought. Becoming an idea machine seems to be about spawning thoughts. Is it possible to do this and meditation? According to Claudia, it is. Plus, some advanced meditators say that with meditation you can change the speed/volume of your thoughts. Granted, it takes a while to get to that point. There were a few other reasons I kind of hesitated attempting the idea list practice and were arguments against. One is: Wouldn’t freelance writers be more successful than they are, or at least more quickly? Don’t they deal in ideas all the time? Another is that James wrote his daily practice helped him turn his life around. But now he is divorced from Claudia. I guess I assumed he would stay together with her. It seemed like a sign of his success after a divorce and multiple bankruptcies. Making the same mistake AFTER you are doing the right thing is kind of an argument against what you are doing. But according to his blog, he seems to be bouncing back. (I still have not gotten to his podcasts; it’s on my to-do list.) It looks like Claudia is taking longer to bounce back. Or she just might be keeping a low profile. She want about a year without any blog posts or tweets, but it looks like she is starting to post more consistently. One inspiration for starting is that James wrote a post in July about how he has lived off of his ideas for 20 years. He mentions that he might give an online/email course about becoming an idea machine. The outline looks pretty interesting. The response was overwhelmingly positive, but so far I do not think there are any updates. His big thing now is doing standup. He hints that one thing he would cover in this course is how he got started writing down 10 ideas a day. On one of his pages he implies he got it from somewhere else. In another post he implies he did it to get interviews. Another inspiration is that the project I am on at work is reducing staff in a couple of months. I work for a big, multinational consulting firm. I am on a team that makes an app for a state government, and while they are happy with us, the department is having to cut their budget. So I kind of need something that will make me a wild success. I asked about some training, but I was told that company policy states that the project would have to pay for it. The problem is that they are rolling a bunch of us off because they have no money. So there goes that idea. On the other hand, my manager is an Indian guy who not only has a thick accent, but also mumbles. It’s possible I completely misunderstood what he said. I have no desire to be a manager. Right now I have to put up with decisions I do not like. If I were a manager, I would have to justify other peoples’ bad decisions to still more people. I have no desire to do that at all. So I need to change how I think and I need to change my life. For reasons I will not go into, getting on a project in Austin is highly unlikely. So I am working through Claudia’s book. I started on October 1. So far it is okay. I might have stopped at nine once or twice, and sometimes my understanding of the question changed while I was coming up with my ten answers but I just kept going. One guy wrote somewhere that he did not like some of Claudia’s topics. One of them is to come up with ten yoga poses. It is a bit hard when you know nothing about yoga. One thing I have found is there are more people than I thought who are doing this, in addition to the people I found online the last time I posted about this. One is a site called idealist.today that sent out idea list topics for about a year. They recently stopped. I subscribed, so I have a backlog to use if I need it. They have a facebook group. I am not into facebook, but I might log on to see if there are any success stories. Another site is 10 Ideas A Day which will give you themes, lets you submit themes, and has a few links to other sites. Some of the links are out of date. Here is one of Claudia on a podcast talking about becoming an idea machine, one of someone on Claudia’s podcast, and someone sharing their lists as they go through Claudia’s book. A guy named D.R. Fideler who moved to Sarejevo got the idea bug from James. He has a post and a PDF about it. It sounds like this guy goes into some detail with his lists. Some are “complete business plans”. Maybe I am not putting enough into my answers. Or maybe the magic will just take longer. Looking at James’ post “How To Have GREAT Ideas” my one-sentence ideas might be too short. Maybe each of the ideas should be lists themselves, like SMART goals. Chris Remus wrote about it here, which I think is a copy of this article. He gives you a list of ideas. Let’s not forget this one and this one and this one. I plan on emailing some of these people to get a bit more info on their daily idea list practice. How long does it take to come up with ten ideas? How long/many sentences is each idea? Where do you get your topics from? Do you ever share your ideas? If so, how? In all seriousness, I would love to know if this guy has read James’ blog and/or Claudia’s book. I looked up his domain on whois, but after a few steps his registrar uses a registrar that uses itself as its own registrar. Using the “Yo Dawg” trick to hide in plain sight. 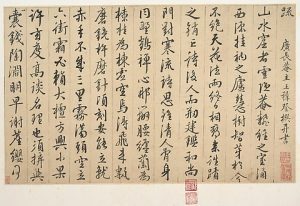 Fragment of a manuscript by Wang Zhideng (1535–1612) available at The Metropolitan Museum of Art, assumed allowed under Fair Use.